Originally published in December 2001 issue of The Chinese Philatelist, official journal of the Philippine Chinese Philatelic Club. There used to be several classes or types of Philippine stamps. There were the regular issues or definitives, commemorative and special stamps, semi-postal stamps, airmail stamps, postage due stamps, special delivery stamps, official stamps and even newspaper stamps. However, since the 1980's, the Philippines have been issuing only 3 kinds of postage stamps: definitives, commemoratives and special stamps. Commemoratives and special stamps are usually larger and more colorful than definitives. They are normally printed in limited quantities and remain on sale for a short period of time. These are the stamps that most collectors look for and are usually the ones that attract new collectors to the hobby. Definitives are smaller and are usually sold for many years since they are normally sent to the press again and again whenever additional quantities are needed. They are the workhorse postage and are usually in different denominations that represent all the basic postage charges plus others for odd rates and for combinations to make up all existing rates. Generally, postal administrators do not promote their definitive stamps to collectors, presumably because they are small and less attractive in design compared to commemoratives, which feature more interesting topics and artistic designs. Definitives are really used day in and day out to carry the mails, the actual purpose for which stamps were created. Most countries make their definitives plain and small, in an effort to save on production costs, since large quantities are needed. When the same design is used and printed again and again for several years, chances are, interesting varieties will be created. Variations in paper, gum, perforations and the stamp design itself can often be found. This is one of the reasons why many collectors and most serious philatelists are into definitives that much, as they find them more challenging. For Philippine Republic stamps, from the very first series of definitives in 1947 up to 1973, every one of them were printed abroad, usually in very large quantities to save on printing and shipping costs. Usually, only one big print order is made for each design and/or denomination. This is the reason why there are hardly any varieties that can be found. Oftentimes, too many were printed, so much so that many remain unsold and become obsolete after every postage rate change. This is the reason why we encounter so many overprints and surcharges and many collectors frown on such stamps. Added to this is the fact that all of these imported definitives were printed in one single color, so they are neither all that attractive nor appealing to most collectors. When we started printing most of our stamps locally since 1973, the definitives were mostly in one single color too, with a few having 2 colors. Most of them were printed in very large quantities, oftentimes by installments and/or with several printings and reprintings. However, even though many printings were made, the same plate without any changes were used over and over again; which is why no interesting varieties were created. The few collectible varieties that can be found are different paper types only and these seldom create much excitement nor offer much challenge, so our definitives continue to be ignored by collectors. Since most of our definitives were single color printings, postal forgeries were discovered time and again. Therefore, the authorities decided that multicolor printings should be used for definitives even if this will increase the printing costs. So starting with the Fiesta Islands '89 series of definitives, all our stamps are multicolored. However, they are still too easy to collect, as the only varieties we can find among them are different papers, many of which can be distinguished more readily only with the aid of an ultraviolet light. The boring nature of our definitives took a dramatic turn in 1991 though. Even though the demand for postage stamps increased tremendously, the budget for stamp printing remained the same; so, the management of the Post Office decided that our definitives should be as small as reasonably acceptable. Instead of 100 stamps per sheet, they should print 200 pieces on the same size stamp paper and come out with mini stamps. This way, they do not have to alter the sizes and qualities of commemorative and special stamps. The new definitive series featuring Philippine flowers on these mini-stamps proved to be the most interesting and challenging up to that time. The stamps are colorful and the designs attractive. There are even se-tenant blocks for the 4 basic rates showing 4 different color morphs of the respective flower depicted. Because of a postage rate hike in December 1991, almost every design was revalued - creating more new stamps to collect. But that is not the most exciting aspect yet. For the first time, there were major varieties created when the printer decided to move the position of the inscriptions and changed the size and/or position of the year date "1991" on later printings in order to avoid unnecessary spoilages. They unwittingly created redrawn designs of 11 stamps, which were hardly noticed by collectors. In 1992, there were again new varieties created when the year date "1991" was changed to "1992" on all the new printings. The reason for this is that both the Post Office and the printer, Amstar, wanted to identify the new printings as such. There is this policy of "first in, first out" and putting the new date will help custodians and tellers decide which stamps to sell first. More importantly, they need to know if the particular stamps are from the new printing or will be part of the renegotiated quantities of the earlier printings for which the Post Office is paying only 50% of the original price. The printer is allowed an additional percentage for spoilages when they were supplied with the security paper, so as to be able to fill the ordered quantities completely. Most of the time, there will be lots of good sheets left after the ordered quantities have been delivered in full. Before, these over-runs were destroyed together with spoiled stamps, but since 1989, the Post Office has been "renegotiating" with the printer for these additional quantities of good stamps and they pay only 50% of the original price. With the changed dates, the new printings became new stamps, which most serious collectors need and want. Aside from these, there are other new varieties of these new stamps for specialists to search for. Since the Post Office became a government corporation in June 1992, renamed to Philippine Postal Corporation, the phosphorescent security mark PPS (for Philippine Postal Service) was changed to PPC for all new printings. Most Philippine collectors are unaware of these interesting varieties because few are equipped with the ultraviolet lamp that is needed to show the phosphorescent security marks. The flowers definitives became one of the most challenging series to pursue. From a face­-different set of 42 values, it can become a 102-value set for specialists! For postal historians, the challenge becomes even greater. Since all these varieties were placed on sale only when that particular denomination is needed, without any announcement, it is indeed a challenge to search for covers showing the first day or early usages of the many varieties such as the Type II's, "1992"-dated, and "PPC" security marked reissues. By 1993, our definitives got even more interesting and challenging. Although the flower definitive series was quite successful, there were complaints that the stamps were too small, and that everyone was sick and tired of seeing the same flower stamps on their everyday mail - that it was getting too monotonous and boring already. So Philpost decided to come out with an entirely new definitive series, even if the last series was in use for only two years. 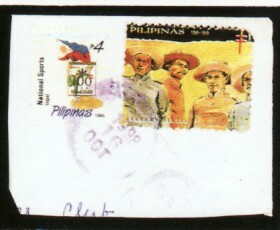 Late in 1992, Philpost experimented with a new stamp size that is larger than the flower mini-stamps, but still much smaller than the Fiesta Islands '89 definitives. They printed the Mt. Pinatubo stamps in sheets of 200 stamps too, but the individual stamps came out in just the "right size" - not too small and still, almost as cheap to produce as the mini-stamps. To address the complaints of seeing the same design on everyday mail, Philpost came out with more varied designs, even putting all 14 designs in the same sheet for local mail. By doing this, there is very little chance that someone will be seeing the same design over and over again on his mail. In fact, it is very likely that many people will take a second look at the various interesting designs and probably even keep the stamps and start their own collections. By putting the flag on every definitive, Philpost did its share in helping our countrymen be more nationalistic and patriotic by constantly reminding them to honor and respect our flag each time they receive a letter. Letters franked with these definitives immediately identify them as coming from the Philippines because of the flag, and with all the various national symbols as the main designs, this series became very educational, too; which is why from the very start, Philpost has come out with a winner! As it turned out, this definitive series became the longest running and most challenging of them all also! This series was in use for 6 years, issued in 18 parts, with a total number of collectible single varieties that most collectors will want or need at 132 different ones, including 10 in a souvenir sheet and 5 se-tenant blocks of 14, plus another 19 stamps for specialists to search for! Everything is there - different papers, different year dates, changes in color, type, size and/or position of inscriptions, changes in phosphor security marks, different face values for the same design, major to minor modifications to the main design, presence or absence of the blue security band and even overprints! All the Philippine flag with national symbols definitives were printed by offset-litho in 4 colors by Amstar, in sheets of 200 (20 x 10). They were all perforated 13 ½. The ones printed in 1993 were all on local paper with "Republika ng Pilipinas", "Kawanihan ng Koreo" and the seal of the Bureau of Posts for watermarks. Starting with the 1994 reissues, all of these definitives were printed on the imported, unwatermarked stamp paper with embedded phosphorescent fibers. All of these definitives have the greenish-yellow phosphorescent security marks of one kind or another, except for the ten P1 stamps from the souvenir sheet issued on June 12, 1993, wherein this phosphorescent marking was omitted. The 5 stamps to kick off the new series were the P1, P2, P6, P7 and P8. The last 4 were for the basic rates: P2 for local mails, P6 for airmail letters to Zone 1 (Asian countries), P7 for airmail letters to Zone 2 (Middle East, Australia, & New Zealand) and P8 for airmail letters to Zone 3 (U.S.A. & Europe). The original plan was to have the flag and denomination on top and "PILIPINAS" at the bottom, but somehow, the designers put the PILIPINAS on top also, so 4 of the 5 stamps ended up with the national symbols covering part of our national flag. The inscriptions were placed at the right side, overlapping the designs and making them so difficult to read. When the authorities finally decided to modify the designs after receiving several complaints, the P1, P6 and P7 stamps were completely printed already. Therefore, only the P2 and P8 were redrawn. For the P2 Flag, aside from the PILIPINAS (which is now in red instead of brown) being moved from the top to the bottom, the black inscriptions were also repositioned. Instead of being centered under the flag, the redrawn Type II stamps have the inscriptions starting from the left side of the stamp. For the P8, the PILIPINAS was changed from brown to red in color, and it was placed at the bottom instead of the top. The black inscriptions were moved from the right to the left, and they no longer overlap the design. Being completely separated from the main design, the flag is now complete and the inscriptions perfectly clear (naturally though, the main design becomes much smaller). The redrawn type was used for all later printings, including the 3 other designs from this Part I that were included in the souvenir sheet of 10 with uniform denomination of P1 that came out with the Part II stamps. The P8 Type II came out earlier, on October 4, 1993. The P2 Type II was not sold until February 10, 1994. Although a lot of this Type II stamps were already printed by December 1993, all were kept in the vaults because over 19,000,000 of the original printing were delivered already. All these 7 stamps from Part I are on the local, watermarked paper. This local paper is not consistent in quality. Some are whiter and/or smoother; some have whiter and/or thinner gums. Under the ultraviolet light, the paper ranged from ordinary to fluorescent to hibrite to reactions in between. These variations of the local paper are true for all the rest of these definitives printed in 1993. The actual quantities printed for these 5 values are very different from those announced in the bulletin. This is due to the fact that there were additional "renegotiated" quantities, new redrawn Type II stamps for the P2 and P8 (the renegotiated quantities consist of only Type II stamps) and also that part of the P2 reported in the bulletin was withheld and used for the printing of the se-tenant block of 14 released in October, 1993. This second part, consisting of the 60s, P1.50, P3, P5 and P10, was not sold until July 9. The reason for this long delay is that two sets of proofs were rejected and new plates had to be made each time. The souvenir sheet was the first in an annual series of 6 souvenir sheets. It contains all the 10 national symbols from Parts I & II, plus 2 labels showing the seal of the Republic of the Philippines. 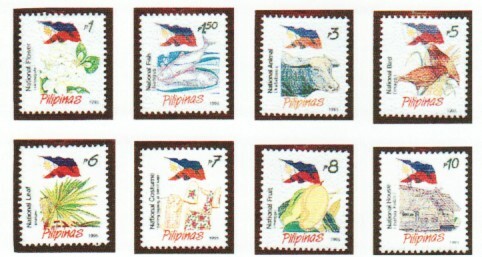 All 10 stamps in the souvenir sheet are denominated PI, and all used redrawn designs with PILIPINAS at the bottom. During printing, the souvenir sheet was arranged in two rows of 4 on the press sheet, and was placed top-to-top, resulting in 3 perforation types. The souvenir sheets on the bottom row during perforating have one side margin imperforate and the other side perforated. The 6 others on top of them are all perforated through. Since they were top-to-top, one of these 2 bottom souvenir sheets will have the right margin imperforate while the other will have the left margin imperforate. The other 6 souvenir sheets from each printed press sheet will have both right and left margins perforated. Therefore, either of the 2 souvenir sheets with one imperforate side is 6 times as scarce as the ones perforated both sides. 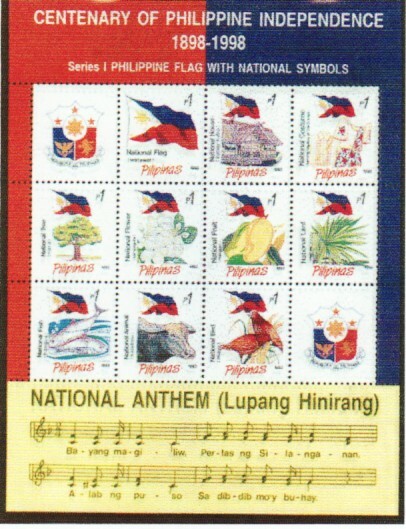 The souvenir sheet was the first in a series to publicize the centenary of the Philippine independence in 1998. All 5 succeeding souvenir sheets have similar headers (top margin with inscriptions). The bottom margin of this first souvenir sheet carries the first of 6 stanzas of the Philippine national anthem. The succeeding stanzas of which, were found on the next annual souvenir sheets, until it was completed in 1998. The 10 stamps from this souvenir sheet are unique in the sense that they do not have any phosphorescent security mark! The "PPC" was printed only once, on the blue portion of the top margin, near the center. All definitives since the Fiesta Islands series 11 of June 1989 carry a phosphorescent security mark of some kind, so single stamps from this souvenir sheet might be mistaken for forgeries! All the 5 stamps and souvenir sheet are still on the local watermarked paper. Since almost 85,000,000 of the P2 Flag stamps (both Typess I & II) were printed already, postal authorities were afraid that many people will again complain that it is the only design they ever see on local mails, even though it is unlikely that they will say they are sick and tired of looking at our flag. So it was decided that all the national symbols should be printed together in one sheet. This way, chances that different designs will appear on any person's mails are greater. Besides, by putting all the national symbols together for the local mail rate stamps, Filipinos will become familiar with all these symbols, as they have a good chance of finding them in their mails. If one does not know that anahaw is our national leaf and this design appears only on the P6 intended for mails to Asian countries, he may never see this and learn about it. Such a block of stamps can become a very good educational tool in schools, too. The unprinted balance of 30,002,400 for the P2 stamp from the original order was therefore changed to this exciting new format. Aside from the 10 previously issued symbols, the Stamp Advisory Committee can come up with only 3 more. It would be extremely difficult and/or confusing to fit 13 designs into a sheet of 200 (20 x 10), so both types of the Flag stamps were needed. Since the block will have 14 stamps (7 x 2), only 2 blocks can be accommodated horizontally in the sheet of 200, which has 20 columns, leaving 6 columns for an incomplete block of 12. To make the sheet nicer, more orderly and more collectible, the 2 flag stamps on one complete block of 14 were placed on the leftmost column and the ones on the other complete block were placed on the rightmost column. The incomplete block of 12 without the 2 Flag stamps in the center of the sheet was thus relegated to be used for mailing purposes only. Each sheet of 200 yields only 10 blocks of 14, 5 of each collectible types. Type A has the 2 flag stamps at left while Type B will have these 2 flag stamps at right. This issue, still on the local watermarked paper, became one of the largest se-tenant blocks ever issued up to that time. What's more, there is a variety of this block available. 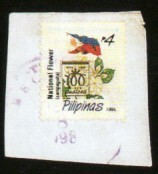 Later printings (Type 11) came with the "1993" on the Flag stamp with brown "PILIPINAS" placed higher by about 1 mm., so it is almost in line with the dates on the other 6 stamps in the row. The earlier printing (Type I) has this "1993" lower, nearer the perforations at the bottom. Unfortunately, even on the same sheet, the position of this "1993" varies slightly; some will be exactly aligned with the rest while others will be a bit higher or lower. We have no record of when this change was made, so we have no idea of exactly how many of each type exists, but it appears that Type II started, at the latest, shortly after 10,000,000 stamps were printed because sheet # 051633 is the Type II already. However, Type II still seems to be scarcer and the one most collectors lack. The two P2 Flag stamps from the se-tenant block can be easily distinguished from those from the regular single design sheets. 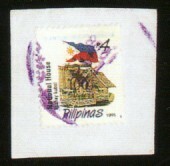 For the Type I stamp, those from the se-tenant block has the "PILIPINAS" and the P2 placed 1 mm. lower, and the flag is also 12 mm. lower from PILIPINAS. There is a bigger space between PILIPINAS and the flag. The "National Flag (“Watawat)" is 1/2 mm. higher and closer to the flag; the "Watawat" is in smaller type, measuring only 4 2/3 mm. in length instead of 6 1/2 mm. For the Type II stamp, the one from the se-tenant printing has the P2 placed 1/2 mm. higher and the flag placed 1/2 mm. lower, so there is a 3-mm. space between the P2 and the flag (instead of 2 mm. only). "1993" is placed 1 mm. lower, making it appear at the level of the middle of "PILIPINAS" instead of at the level of the top edge. "National Flag (“Watawat)" is almost 1 mm. higher, so it touches the rope of the flag. For both Flag stamps from the Type II se-tenant block printing, all the changes mentioned above were maintained, except that all the black inscriptions are thinner and much sharper now. Also, on the Flag stamp with the brown PILIPINAS, "1993" is about 1 mm. higher. The distance from its top edge to the end of the flag's rope is 2 2/3 - 3 mm. instead of 4 mm. All the other 12 stamps in the Type II block also exhibit the thinner and much sharper black inscriptions when compared with the original Type I block. As mentioned earlier, the quantity of this block (both Types I & 11) represents the balance from the original order of the P2 value. 30,002,400 were ordered and with the renegotiated quantity of 1,290,000, a total of 31,292,400 stamps were delivered. That means there were 156,462 sheets of 200. Since each sheet yields only 10 blocks of 14, there are only 1,564,620 blocks of 14, divided equally into Types A & B. Starting with this issue, all the national symbols definitives were printed on the imported unwatermarked paper with embedded phosphorescent fibers. This issue consists of only 6 values, the P1, P3, P5, P6, P7 and P10. All have the new "1994" year date and the P6 and P7 are new redrawn Type 11 designs. However, since these reissues were not considered new stamps, despite their obvious changes, no official FDC nor cancel exist. In fact, no bulletin was prepared because these reissues were pressed into service only when the need for that particular denomination arises, so there are several different first days of sale for these 6 stamps. This issue consists of 8 values, P1, P1.50, P3, P5, P6, P7, P8 and P10. All have the new date "1995", which is positioned much lower than their counterparts in 1993 and 1994. Again, these reissues were not considered new stamps, even if the P8.00 is on unwatermarked paper for the first time. Neither official FDC nor cancel exists also, and as expected, there are several different first days of sale again. All the P3.00 national symbols definitives (including those dated 1993, 1994 and 1995) were withdrawn from sale on April 3, 1995 and all post office stocks recalled starting June 20, 1995 under an all­ office message No. 95-4513 dated May 31, 1995 after discovery of alleged postal forgeries, which no collector nor dealer has ever seen or studied, and which probably are just washed and/or reused stamps only. Between June 20 and July 3, recalled stamps totaled 3,174,420, which were added to the balance of 14,000,000 still in the vaults. Almost all of these stamps were dated "1995". 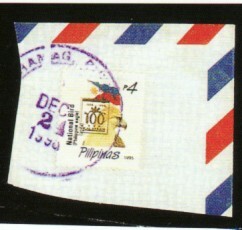 These withdrawn stamps were subsequently overprinted with the Philippine Centennial Commission logo and reissued in 1998. This is basically a reissue of the Part III block, except that it is now on unwatermarked paper and each stamp is dated "1995". All the stamps were redrawn to include the blue security band that appears at the top of the designs, therefore, the main designs became smaller. The size and position of the inscriptions at left and the year were changed on most stamps too. The blue security band is supposed to be an additional security feature because somebody believes that such a band will make the stamps more difficult to fake! Actually, it is just a band composed of short lines and strokes with the word "Philippine Postal Corporation" hidden within it, and you need a good magnifying glass to see what you already know is there. By this time, our national bird had been changed from the Maya to the Philippine eagle. Therefore, the design for the national bird on this block was changed. n the 1995 stamp program, there were 9 values in the definitive series to cover all the commonly used rates. However, only 8 national symbols definitives were actually re-issued with the "1995" year date by May. The P2 reissue was held in abeyance as there were so many P2 commemorative and special stamps in the vaults. Most issues of 1994 were in P2 denominations and the printing quantities for 1993 issues were mostly 600,000 each - which were simply too much! Another reason for the delay in the printing of the P2 was that there was a planned postage rate hike, which was expected to first affect the local rate only. The rate hike was initially planned for March 1995, and then it was postponed to July, then October until finally, Philpost felt it could no longer subsidize the local rate and was bent on doubling the local rate to P4 starting November 1. For several years, Philpost had been subsidizing the local mail. Even when the rate was still P2, it costs more to process a letter than what the mailing public was paying. But the costs kept increasing, until it was costing P3.72 to process one local letter. However, there was a requirement that petitions for such local postage rate hikes should be published in newspapers of general circulation for at least 3 times within 3 weeks before these can be taken up during public bearings at the Department of Transportation and Communications (DOTC). In this instance, it took several of such hearings. By October, the P2 stamps were about to be depleted, so it was decided that out of the 60,000,000 pieces allocated for the P2 definitives in the 1995 program, they had to print 50% right away, as Philpost was not sure when the rate hike could finally be implemented. So on November 2, the P2 Flag re­issue was placed on sale. This quantity of 30,000, 000 were printed as an emergency measure since Philpost expected to raise the rate to P4 by December 1, 1995. Therefore, the balance of 30,000,000 was ordered with the new P4 denomination. Unfortunately, the public hearings at the DOTC took much longer than anticipated, so the rate hike could not be implemented as planned. When the approval was finally given, there was another requirement that an announcement for this should be published in major newspapers at least twice, 2 weeks prior to its implementation. So the earliest date it could take effect was January 8, 1996. The actual quantities printed for this P2 reissue was 30,000,000 ordered plus 1,341,800 renegotiated on October 28, 1996 for a total of 31,341,800. Just like with the original block of 14 issued in 1993, each sheet of 200 yields only 10 complete blocks of 14 (5 Type A and 5 Type B). So only 1,567,090 blocks of 14 exist. As mentioned earlier, this revalued block was ordered when Philpost thought they could implement the rate hike by December 1, 1995 or very soon thereafter. The 30,000,000 pieces ordered were actually one half of the approved quantity for the P2 denomination in the 1995 program. They were printed in early December of 1995, to enable Philpost to distribute them to all regions. The custodians were instructed not to start selling them until the planned date of issue, which is to be the day when the rate will become P4. Unfortunately, some were sold even before Christmas - once again showing that many regional custodians do not follow instructions. Since these stamps were to be paid for with funds from the 1995 stamp printing budget and were actually printed in late 1995, all were dated "1995", even if they were officially sold only starting January 8, 1996. The actual quantities printed were 30,000,000 ordered plus 836,800 renegotiated on January 7, 1997, for a total of 30,836,800. Therefore, only 1,541,840 complete blocks of 14 exist. Since all the other postage rates were also expected to increase soon, with a tentative date of February 1, 1996 (which was later changed to March 1, then to April, July and finally postponed indefinitely), most values were expected to become obsolete once the rates change, so only the P4 were needed in quantity. However, since stocks of the low values were already depleted, there was an immediate need to print also the PI, P1.50, P3 and P5 stamps. In order to avoid printing values that may soon become obsolete, only 3,000,000 of each of these 4 values were ordered initially, with the balance to be revalued to future new rates. This is the reason why the quantities reported for these 4 values in the philatelic bulletin are only 3,000,000 each. Since the planned rate hike did not push through until 1998, later quarterly orders changed the actual quantities ordered. For the P1 and P1.50, they were less than in the program, but for the P5, it was more. Before the new order was placed, it was pointed out that with the reissue of new P3 stamps in the old design, the probability of forgeries resurfacing again will be great. It should be recalled that allegedly dangerous postal forgeries of the P3 Kalabaw stamp were discovered in 1995, so that all unsold stamps were withdrawn from sale and all stocks recalled and returned to the vaults. To prevent this from happening, it was decided that the design for the Kalabaw stamp should be changed. So instead of only the head, the whole animal will be depicted. Since the national animal was included in the se-tenant block of 14 x P4, it was only appropriate to change that particular design, too. Because these 5 values scheduled for issuance on February 12, 1996 were ordered and printed in 1996, to be paid for with funds from the approved stamp printing budget for 1996, they naturally carry the new "1996" year date. The 4 single stamps are actually new stamps even if we ignore the year change, since the designs now include the blue security band and the P3 and P5 are entirely new designs. The P4 block as a whole is new also because the Kalabaw design is new. The P1, P1.50 and P5 were needed very badly, so the printer was requested to rush the printing of these 3 stamps first. The P4 block was not made available for sale until February 19, and the P3 was not delivered until March 1. The reason for the long delay in the delivery of the P3 stamps was due to the fact that its printing was actually cancelled when the Chief of Postage Division said that there was no longer any need for a P3 stamp since the local rate had increased to P4. The P3 was used mainly for special delivery letters (P2 + P 1 additional fee), and now that it rose to P5 (P4 + P 1), there was naturally no more need for the P3. Unfortunately, this was not conveyed to the Philatelic Division or the printer on time, so the P3 value appeared in the philatelic bulletin that was distributed a few days after the issuance on February 12. After some consultation, it was finally decided on February 21, 1996 that the printing of the P3 stamp should proceed to avoid confusion. Since this stamp has an entirely new design, it can still be used in combination with other stamps for other rates. By early 1997, the following designs from the 2 types of se-tenant blocks of 14 were ordered removed because of discovery of alleged forgeries: Flag, flower, animal and dance. On August 25, 1997, then PMG Intia circulated an all office message No. 97-39P recalling all P4 definitive stamps featuring the national symbols. Effective August 31, 1997, selling of these stamps shall immediately be stopped and letters affixed with said stamps refused. Postmasters must return to their respective regional stamp custodians all stocks of these definitives on or before August 31, 1997. The regional stamp custodians shall return all stocks of the recalled stamps to the Postage Division, Central Office, not later than September 30, 1997. Mailers with unused stamps after August 31, 1997 can return them by exchanging them for another definitive issue of similar value at the post office starting September 1 to 15 only. However, the redemption period was later extended by another month. On August 26, 1997, a memorandum was circulated to all regional directors and regional stamp custodians instructing them to distribute to all post offices the new P4 "South Sea Pearl" definitive issued on June 10, 1997, adding that the said stamp was issued purposely as replacement for the P4 definitive stamps featuring the 13 national symbols. This issue consists of the P7, P8 and P10 stamps. They were also redrawn to include the blue security band, so the main designs are naturally smaller. The quantities printed for the P7 is over and the P8 is less than the quantities approved in the 1996 program. For the P7, after the 7,000,000 were completely delivered, there was an additional order during the last quarter for another 3,000,000. Adding the renegotiated quantities of 184,600 for the original order and 141,600 for the additional order, the final total becomes 10,326,200. For the P8, originally, the order totals only 12,000,000 but an additional order of 1,000,000 were made in the last quarter, which were delivered only on January 29, 1997. Adding the renegotiated quantities of 284,600 from the original printing and 74,800 from the additional printing, the final total comes to 13,359,400. For the P10, the programmed 2,300,000 were ordered, and with the renegotiated quantity of 178,600, the total became 2,478,600. All of these 3 reissues were sold starting May 7, 1996 only, although the first day cancel still reads April 19, 1996. This single stamp was redrawn also to include the blue security band, so the basic design (flag & leaf) is smaller than on the earlier 1994 and 1995 reissues. This completes the set of single designs dated "1996" which totals 8 values from the 3 issuances. The quantity printed was the programmed 3,000,000; but with the additional renegotiated quantity, the total comes to 3,116,800. The "1997" dated reissues are the most complicated series since there are actually 3 separate groups: without blue security band, with blue security band and with new style phosphorescent security mark. For the first group, which has the blue security band at the top removed, the P1, P5, P7, P8 and P10 are similar in design to the "1996" reissues except for the "1997" date. Strangely though, the P6 has the bigger design of the "1994" and "1995" reissues. All 6 stamps are without the blue security band that is printed on all stamps (definitives, commemoratives and special stamps and even on stamps in souvenir sheets) since the Catholic Bishops Conference of the Philippines stamp of July 22, 1995. However, this security band is not really totally omitted. It just became part of the phosphorescent security mark, which can be seen only with the aid of an ultraviolet light. It appears as an additional line (lower than where the printed blue band should be) above the normal "PPC" which is printed sideways, reading up. The reason for this change is that many collectors complain that the presence of this blue band often makes the stamp design look off-centered even if it was perforated perfectly. Everyone knows that such a band will not make it more difficult for criminals to create forgeries. If they can copy the multicolored designs, why would such a simple band make things more difficult for them? So the officials decided to just incorporate this security band to the usual phosphorescent security marking, which I think is a wiser decision. Starting with the first 1997 issue, the Hong Kong 1997 Exhibition souvenir sheets, this band was removed from all commemorative and special stamps. However, not long afterwards, the authorities decided that the commemoratives and special stamps could do without this printed blue band, but not the definitives! Therefore, with the revalued P2 sampaguita definitive issued on April 15, 1997, the printed blue security band was put back on all definitives, including newer printings of the 5 other values in the "1997" reissues. Up to this day, all definitives carry this printed blue security band, except for the P5 Roxas-Quirino definitive pair issued on February 6, 2000.It was gathered that the absence of the security band on this pair of stamps was a mistake that was not caught in time. Though these reissues without the printed blue band with blue PILIPINAS are so different from previous issues, they were again treated as "reprints" for postage use only, so no official first day cover or cancel exists. However, a bulletin without illustrations was later distributed, announcing the release of these reissues, plus the P3, which actually carry the printed blue band already. By the second quarter, new orders created the second group of "1997" reissues, which include the printed blue band again. These later printings included a P3 stamp but there was no P1 stamp because the latter was revalued to P2 and issued officially with a first day cover and bulletin. When Amstar delivered the accumulated renegotiated quantities, those with and those without the blue bands were counted together, so the exact quantities of each type is unknown. The best we can do is come up with estimates; using the respective quantities printed and pro-rating the total renegotiated quantities. Since these reissues were again sold only when the need for that particular value arises, there are several first days of sale. The P1 Sampaguita stamp was revalued to P2 to meet operational needs. It is quite similar to the P2 stamps from the se-tenant block issued on November 2, 1995; but upon closer inspection, aside from the new "1997" date and blue PILIPINAS (instead of red), more of the main design is shown on the new printing. There are more green leaves at the left and bottom, the black inscriptions at left is farther from the main design and is closer to the left perforations. The quantity ordered were 3,000,000, but there was a renegotiated quantity of 129,000, making the total 3,129,000. Except for the P3 which was not included in the first quarter order, the other 5 values (P5, P6, P7, P8 and P10) were additional orders made during the 2nd and 3rd quarters, and all 6 values now have the blue security band at top. The P6 changed back to the smaller design used in the "1996" reissue. With the blue security band back, the phosphorescent security marking reverted to the original with "PPC" only. By the 4th quarter, a new style phosphorescent security mark was used. This consists of 3 parts: Philpost logo in the center, an upright "PPC" at the bottom and a vertical line identical to the blue security band at top. On many stamps, this band is very difficult to see or almost absent. Since this new phosphor marking can be seen only with the aid of the UV light, very few collectors are aware of this. But to specialists, these are entirely new varieties. So I will separate these and treat them as a subtype of Part XIV, as the last group of the "1997"- dated definitives. I will also separate the quantities for each variety. Of course, just like the first quarter reissues without the blue band, the quantities are estimates only since the printer had mixed both types when they delivered the additional renegotiated quantities. These reissues were again considered as "reprints" for postage use. Neither official FDC nor bulletin exists. And as usual, there are different first days of sale. Since there was no new P4 stamp reissued with the "1997" date yet, the stock of this local rate stamp was almost depleted when this new design was being prepared. This stamp features an entirely new national symbol, the South Sea Pearl, which was then recently declared as the national gem. At about this time, alleged forgeries of several designs in the P4 se-tenant block were discovered. It was then decided that reissuing the se-tenant block with "1997" date with this new symbol to replace the Type I Flag stamp will no longer be considered, and this new single design will replace it. As it turned out, after 2 months, regional custodians were instructed to distribute this stamp to all postmasters, who were to use this in place of the se-tenant block, which was being recalled. In fact, this will be the stamp that will be given in exchange for any P4 stamps from the se-tenant block, which postal patrons will return during the specified redemption period. The original second quarter order was for 20,000,000. The third quarter order was for 13,000,000. These 2 printings came with the "PPC" sideways phosphorescent marking. However, the fourth quarter order of 18,000,000 was printed with the new style phosphor security mark consisting of 3 parts (PHILPOST logo in the middle, a line identical to the blue security band on top and an upright "PPC" at the bottom). I will include this variety with the new style phosphor as part of the subtype of Part XIV, together with the 4 other values from Part XIII. Again, since Amstar did not segregate the 2 varieties when they delivered the renegotiated quantities for the 3`d and 4`h quarter printings, I have to give an estimate by using the respective quantities printed for each type and pro-rating them. This is the third and last group of reissues dated "1997". The P4 is from Part XIV and the others (P5, P6, P7, P8) are from Part XIII. They are all identical to the earlier printings except for the new style phosphor security mark, which can be seen clearly only with the aid of an ultraviolet (UV) lamp. The renegotiated quantity for the P4 is an estimate only, since the 541,000 received on April 3, 1998 included stamps from both the third and fourth quarters, and both types were counted together. With the increase in postage rates including parcel posts and express mail service since 1996, there has long been a need to issue definitives higher in values than P10, as most heavy parcels and express mail pieces need hundreds of pesos in postage. Although many mailers just use postage meters for these, there are still those who prefer stamps. So multiples of the highest value, P10, was needed and obviously, there was a lot of wastage in stamp printing costs. Curiously, most custodians and tellers object to high face value stamps because of the fear that any mistake will cost them a lot, and many postal patrons are afraid that chances of high value stamps being stolen before the mail matter is dispatched is higher too, as temptation will be greater. However, after some serious discussion, it was decided that high values of P20, P30 and P50 should be added to the national symbols definitives series. To discourage forgeries, these high values will be printed in commemorative size. 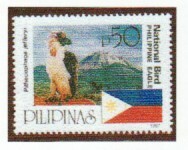 To publicize the new national bird, all 3 stamps were to feature the Philippine Eagle. Slides were provided by the Protected Areas and Wildlife Bureau (PAWB), but it still took several weeks for the designers and printer to come out with the stamps. Only the P20 and P30 were finally issued on December 24, 1997. The P50 was delayed because at the last minute, the design was changed to another picture provided by a photographer from Davao. Starting with these 3 Eagle high values, all new commemorative-sized stamps have the latest phosphorescent security marking. This is printed all over the sheet, including the sheet margins, and consists of "Philpost" with its logo above it and a line identical to the blue security band below it. These are arranged close together, in lines, in 4 orientations: upright, inverted, sideways and sideways inverted. The ones printed sideways do not have the line below Philpost. This is the highest denomination of all Philippine postage stamps to date. As mentioned earlier, this was supposed to come out together with the other 2 high values, but due to a last-minute change of design, it was postponed to December 10, 1997. However, since the printer took a Christmas break after delivery of the other 2 high values on December 24, 1997, this P50 stamp was not issued until January 13, 1998! There were also 500,000 ordered, but with the additional renegotiated quantity, it became 530,000. After the P4 se-tenant national symbols were withdrawn and invalidated in 1997 upon discovery of alleged forgeries of several designs, they were recalled and over 20,000,000 were returned to the vaults. 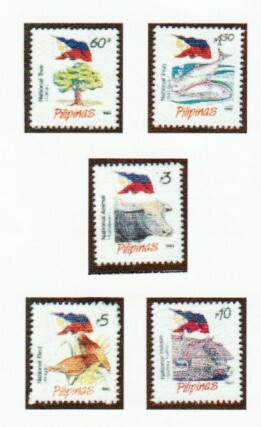 With the approach of the Philippine Independence Centennial on June 12, 1998, a perfect occasion to make use of these stamps presented itself. By overprinting them with the National Centennial Commission logo, Philpost can also help publicize the centennial of our independence, a significant milestone in our history. The additional overprint should discourage people who may have produced or are holding any forgeries, if indeed there really are such, from trying to use those forgeries again. Several colors were tried, but gold was finally chosen, as it will not mess up the original designs as much as other colors. The special gold ink is relatively more difficult and expensive to print also, which should make the criminal less inclined to produce fake overprints, too! The logos were intentionally printed on different positions on the stamps in the block to avoid covering too much of the main design. These stamps were retrieved from the vaults and sent to Amstar for overprinting in 3 batches. The first batch was sent on June 3, 1998 and totaled 15,000,000. Out of this, 100,000 were spoiled during overprinting and later destroyed. The second batch, sent on July 1, consisted of 2,700,000 pieces but 163,000 were spoiled. The third and last batch, sent on October 2, totaled 3,156,400 pieces and out of this, 153,000 were spoiled. A total of 20,440,000 pieces in 102,202 good sheets of 200 were therefore delivered and sold. Only 1,022,020 complete blocks of 14 exist, with half being Type A and the other half Type B. Only the sheets dated "1996" were supposed to be overprinted, but somehow, 15 used copies dated "1995" were found. Out of these, there were 11 different designs, with only the 2 Flags and the Rizal stamp unaccounted for. No mint copies were ever found. This overprinted stamp was supposea to oe put on sale together with the overprinted se-tenant block, but the printer said they could not cope, so this was postponed. Although all the P3 Kalabaw head definitives, including those dated "1993", "1994" and "1995" were withdrawn in 1995 upon discovery of alleged forgeries, only the "1995" dated ones were sent for overprinting. Whether any of the "1993" and "1994" dated ones were mistakenly included remains to be seen. Just like the P4 se-tenant block, this stamp was sent to Amstar in 3 batches. The fast batch of 14,000,000 was sent to Amstar for overprinting on June 18, 1998. Out of these, 140,000 were spoiled. The second batch of 3,220,000 was sent on July 1, and 60,000 were spoiled. The third and last batch of 1,606,600 was sent on October 2 and 38,400 were spoiled. Therefore, a total of 18,588,200 of this overprinted stamp exist. I have covered the entire series of 18 parts for this Philippine flag with national symbols defmitives chronologically, and it should now be easy for collectors of mint stamps to follow and to identify their stamps. However, some collectors prefer used stamps, so it is expected that singles from the souvenir sheet and the se-tenant blocks will be encountered. To make it easier for everyone to identify any national symbol definitive he may have, another article listing the stamps by national symbols will be very helpful. There are 14 national symbols depicted on 151 different single stamps. Most of these symbols were issued with 3-4 different denominations. Therefore, a list with illustrations of every single stamp with a particular national symbol and a detailed description of the changes made in subsequent printings will enable everyone to identify any national symbol definitive he may come across much more quickly. In the next article, I will also cover the "SPECIMEN" stamps printed for several of these definitives. I will list the various errors, freaks and oddities (EFO's) recorded for these issues, too.